Assassins at Ospreys by R. T. Raichev, a Mysterious Review. Review: The challenge in writing a mystery genre "cozy" is to retain the often shop worn conventions of the form but with liberal doses of imagination, experimentation, intelligence and perhaps even sprinklings of irony, satire and fun. In Assassins at Ospreys, the third volume in the Antonia Darcy – Hugh Payne series, R. T. Raichev has more than met the challenge with a novel that combines the best of Agatha Christie's detective work, the sparkle-in-the-eye fun of Alexander McCall Smith, and the riveting attention of a game of Clue. Raichev's story is to be read as much for the side trips it takes in presenting a writer writing about other writers and making remarks about them, as for the comfortable pace at which the story moves, the relative ease with which the mysteries are solved, and the sense of comfort that the guilty parties will inevitably be caught and punished to return the world to its rightful order. As with other cozy who-dunnits, Raichev's depends on the self-reliance of the main protagonists, in this case mystery writer Darcy and her husband, Major Payne, to solve the current mystery, as they have done for two earlier ones, without too much outside intervention from the local police. And the murder and mayhem mystery at the Ospreys estate, thanks to Raichev, is clearly laid out and easy to follow, although there are sufficient red herrings, potential suspects and disguised characters to trap the unwary reader. There are also coincidences and exaggerations which stretch credibility but the novel is after all, a comfort-zone cozy, and one with tinges of irony and satire as well. Even chapter titles like Lord of the Flies, The Mortification of Moriarty, and The Hound of Death elicit a certain levity, especially in light of the contents of the relevant chapters. And then there are the characters. Wealthy and dying Ralph Renshawe "had made all the arrangements for his own funeral". And to ensure the old man gets to his final resting place sooner rather than later, his "nefarious nephew" Robin has teamed up with a rogue cleric, Father Lillie-Lysander, who sells tidbits from the confessional to Robin and others. But in a comedy of errors, a doppelganger of Ralph's ex-girlfriend Beatrice "Bee" Ardleigh, a friend of Antonia's and an on-again, off-again invalid, gets caught up in the dastardly deeds as well, leaving the final few pages of the novel for the Darcy and Payne duo to sort out who the assassins at Osprey were and how and why a missing nurse, a jealous husband, a set of knitting needles, a Polaroid photograph and a Taj Mahal necklace fit into the scheme of things. Raichev's story is a light and entertaining read, cleverly done, and worthy of a weekend read. 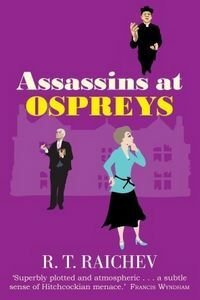 Special thanks to M. Wayne Cunningham (mw_cunningham@telus.net) for contributing his review of Assassins at Ospreys. Acknowledgment: Soho Press provided an ARC of Assassins at Ospreys for this review.